Warehouse 300 celebrated its Grand Opening in November, 2018, and already it is a favorite go-to for home decor. 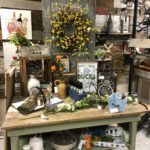 The vintage marketplace in Trenton is a collection of local vendors and artisans who rent the space to showcase their selections of rustic, farmhouse and shabby chic items. 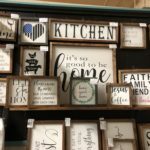 signs with cool and meaningful sayings, painted furniture make-overs, one-of-a-kind pillows and towels, lamps you won’t see anyplace else, gift items, and so much more. Customer service is great here so feel free to ask if you’re looking for something special. The store enjoys creating an experience for shoppers so it hosts themed events about every six to eight weeks. For instance, this coming weekend, April 13-14, 2019, Warehouse 300 is having a Vintage Garden Party spring sale. Vendors will be marking down select items, including furniture. There will be sweets from Cocoa Exchange Treats and a bike giveaway for some lucky shopper. 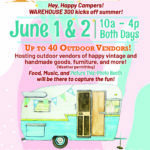 Look for another great event in June: Happy Campers kick-off to summer. Scheduled for June 1-2, this weekend will feature outdoor vendors and unique artisans with vintage goods and homemade crafts. Wednesday – Saturday, 10:00 a.m. – 4:00 p.m.
Sunday, 1:00 p.m. – 4:00 p.m. Whether you come to shop, dine or play, you’ll find a lot to like in Clinton County! This entry was posted in Events, Home & Garden, Local Businesses, Shopping and tagged Clinton County, Clinton County business, Clinton County Shopping, Clinton County tourism, summer event by admin. Bookmark the permalink.